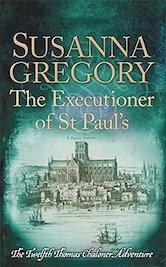 Historical crime fiction. 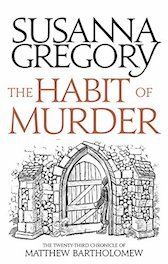 Medieval murder mysteries. 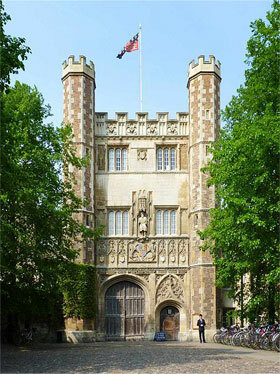 Trinity College was founded in 1540 by Henry VIII. Henry, however, was a prudent and frugal king, who always had a watchful eye on the state of the royal coffers, and was not given to spending money when he could avoid it. He decided, therefore, not to purchase new land and buildings for his foundation. Instead, he ordered two colleges and seven hostels to surrender to him, and simply amalgamated them under a new name. The colleges were Michaelhouse and King’s Hall, both wealthy institutions that owned sizeable tracts of land and a number of buildings; the hostels were Physwich, Gregory’s, Ovyng’s, Catherine’s, Garratt, Margaret’s, and Tyler’s (Willis and Clark 1988). The 1540s were dangerous times for institutions filled to the gills with clerics – monasteries and abbeys were falling like ninepins, and the universities probably sensed it was only a matter of time before their own properties came under the greedy scrutiny of royal eyes. According to tradition, it was Catherine Parr, the last of Henry’s wives, who persuaded her husband to leave the places of learning alone (Stamp 1924; Leader 1988). Given that Henry still held a grudge against Cambridge for producing such vocal opponents to his divorce of Ann Boleyn as the Michaelhouse martyr John Fisher, the Masters and Principles of the nine foundations probably thought they were escaping lightly by surrendering to the king with a view to being part of a new royal foundation. The two colleges – Michaelhouse and King’s Hall – were very different. King’s Hall was a large institution founded by Edward II as a training ground of his chancery clerks. Many of its scholars went on to great things – bishops, diplomats, royal chaplains, and lord chancellors (Dyer 1814; Cobban 1969). Its fellowship seldom dipped below twenty members (and was more usually thirty-two), and household accounts suggest they lived a life of comparative comfort (Cobban 1969). By contrast, Michaelhouse was founded for impoverished clerics and its fellowship was much smaller – usually six or seven fellows and the Master (Dyer 1814; Trevelyan 1983; Leader 1988). Of King’s Hall, there remains a line of gothic arches, and King Edward’s gateway (1426–27), although this was moved from its original position in 1600 (Willis and Clark 1988). It is also commemorated in a name – one of the residential buildings is called King’s Hostel. Of Michaelhouse, however, virtually nothing remains. Since the days of Michaelhouse and King’s Hall, the streets of Cambridge have changed a great deal. Lanes that ran from the High Street (now Trinity Street) to the hythes on the river have been enclosed by the colleges, while Milne Street – then one of the two main roads through the city – is now blocked by King’s Chapel and by Neville’s Court at Trinity. 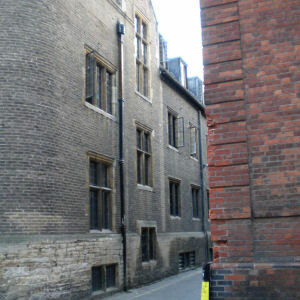 However, Michaelhouse has left a greater legacy to modern Cambridge than a few buried foundation stones: it is my contention that Michaelhouse’s location and original buildings lent modern Trinity part of its present outline and allowed the continuation of St Michael’s Lane (now Trinity Lane) as a public thoroughfare. Although the precise location of some of Michaelhouse’s original properties are debated, there is sufficient documentary evidence available to allow speculation, particularly when taken in conjunction with early maps of Cambridge and the available – albeit scanty – archaeological evidence. In terms of recorded history, King’s Hall fared better than Michaelhouse, perhaps because of its importance as a royal foundation (or perhaps because it was full of clerks? ), and an exhaustive study from its foundation in 1317 to its surrender in 1540 has been possible (see Cobban 1969). Michaelhouse, being smaller and less prominent, is not so well documented. However, those deeds that have survived are in Trinity’s muniments room, some bound in the remarkable Otryngham Book.2 Most documents are brief, and many use a form of shorthand that is often difficult to decipher (Cobban 1969), so that interpreting them is frequently a matter of guesswork. None of the household accounts have survived (Willis and Clark 1988). Several attempts have been made to link Michaelhouse’s documented history with early plans and drawings of the city. The best of these include the booklet published privately by Stamp (1924) to mark Michaelhouse’s sexcentenary, and the classic account of Willis and Clark (1988). None of them, however, take into account the findings of Atkinson (1891–94), who studied foundations exposed during repair work. Michaelhouse was founded in 1324 by a wealthy lawyer-churchman called Hervey de Stanton. Stanton not only held the wealthy livings of a number of churches, but was a successful lawyer and was appointed Chancellor of the Exchequer (1316) and Chief Justice of the Pleas (1323) (Stamp 1924). He had amassed a great fortune by then, so much that Queen Isabella appropriated £800 that he had casually deposited in St Edmundsbury Abbey when she was on her way to oversee the plot to murder her husband Edward II (Stamp 1924). Contemporary Court Rolls suggest Stanton led an active life, and he was probably in his late fifties by 1324 when he founded his college – like many people of his age, he probably believed such an act would atone for past sins, as well as providing him with a chantry (his statues stipulate a set number of masses to be said annually for his soul) (Otryngham: 22). In 1323, Stanton purchased a messuage from Dera of Madingle next to St Michael’s Church on the High Street, along with the church’s advowson (Otryngham: 1–2; Victoria County History 1959). It is possible that he originally intended his College to be located here (Stamp 1924). On 16 March 1324, he bought a house and garden from Roger and Robert Buttetourte that stood at the junction of St Michael’s Lane and Foule Lane (Otryngham: 4; Stamp 1924; Willis and Clark 1988). This house, originally thought to comprise two properties (Stamp 1924), had grounds that ran down to a navigable stream3 and included a working hythe (See Map 1). 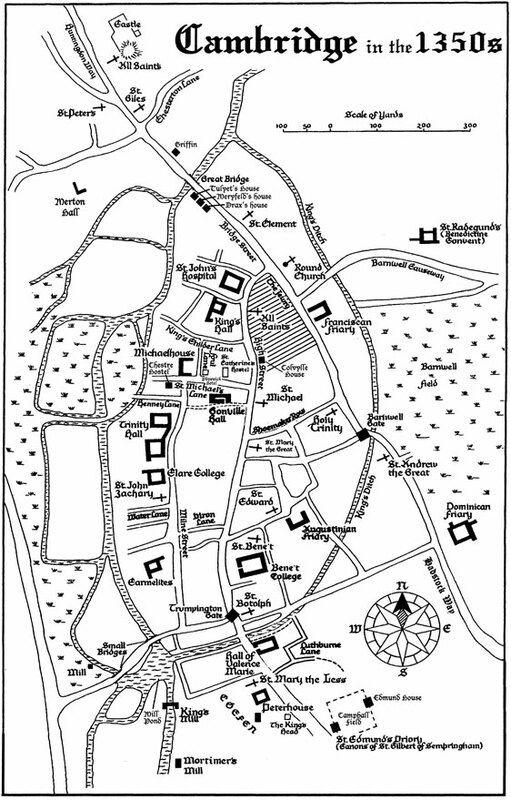 Map 1 – Cambridge as it might have been in Bartholomew’s time. Immediately, we run into difficulties. Willis and Clark (1988) give the boundaries as ripa domini Regis (west), St Michael’s Lane (south), the ‘highway that leads to Dame Nichol’s Hythe (north), and John Welles’ messuage (east). Dame Nichol’s Hythe stood at the end of King’s Childer Lane, which makes for an improbably huge plot. Other authorities (Atkinson and Clark 1897; Victoria Country History 1959; Stamp 1924; Trevelyan 1983) place Michaelhouse farther south, so that its boundaries are St Michael’s Lane (south), ripa domini Regis (west), and Milne Street (east). The northern boundary is undefined. However, this location has its problems, too. Early maps indicate that Milne Street ended at its junction with St Michael’s Lane (Atkinson and Clark 1897; Victoria Country History 1959), so it could not have formed an eastern boundary, and there is also the issue of Foule Lane. Foule Lane was described by Caius (1545)4 as a muddy alley that ‘started from the place where the second and larger gate of Trinity College which opens into S. Michael’s Street (vicus) now stands; and it was continued in a straight line to the inner gate where the lavatory (lavacrum) now is.’ This might be construed as a continuation of Milne Street (it did run in a north–south direction), although, if Caius is correct, it would have formed something of a dogleg. It seems simpler to suppose it was a separate lane running between St Michael’s Lane and King’s Childer Lane. This means that the Buttetourtes’ house fronted onto Foule Lane, and this formed the eastern boundary, not Milne Street. This projected location of the Buttetourte land also corresponds to the geography in a document of 1306, which states that the southern wing of the Buttetourte house overlooked St Michael’s Lane, and that the brothers applied for and were granted permission to enclose it (Otryngham: 6; Stamp 1924). The western boundary of the property is still the ripa domini Regis, while the southern boundary becomes the section of St Michael’s Lane that ran between Foule Lane and Milne Street. The northern boundary remains uncertain, although later acquisitions by the College renders doubtful Willis and Clark’s (1988) contention that it was King’s Childer Lane – especially when subsequent deeds are considered, when it becomes very clear that Michaelhouse did not own all the land to King’s Childer Lane. The Buttetourtes’ house formed the heart of the college. Stamp (1924) maintains it was an L-shaped building, but the original title deed (Otryngham: 6) indicates that it was originally two houses, one standing north of the other. Given this, it is likely to have been a modified E-plan, where the two houses were joined by some kind of wing. The scholars moved in on Michaelmas eve 1324. To fund their living expenses, they were presented with the advowson of St Michael’s Church and Dera de Madingle’s house (Stamp 1924). In March 1326, Stanton entered negotiations for the purchase of yet more property for Michaelhouse. From one Adam de Trumpington, rector of Buckland, he bought two houses, one on the High Street north of Dera de Madingle’s home, and one immediately to the north of the College (Otryngham: 36–39; Victoria County History 1959; Stamp 1924). However, again, there are difficulties in understanding the exact locations, particularly of the latter messuage. In the words of the Otryngham Book (36–39), it was ‘situated in S. Michael’s Lane, on the north side of the principal part of the College, namely between the hall and the kitchen’ (Willis and Clark 1998). 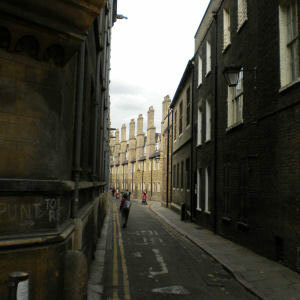 However, if this property is on St Michael’s Lane, then it cannot be to the north of the College. The Otryngham Book (36–39) then goes on to describe the location as lying in Milne Street, between Michaelhouse on the south, and another house to the north, abutting onto a ‘highway’ in the east. Again, if the house is in Milne Street, then it cannot be located to the north of Michaelhouse. The only way to make Adam de Trumpington’s house lie to the north of Michaelhouse is to assume Milne Street continued beyond Michaelhouse to King’s Childer Lane, making the ‘highway’ to the east Foule Lane. Both the High Street messuage and Adam de Trumpington’s property were transferred to Michaelhouse on 11 November 1324 – and unlike the advowsons of Cheadle and Barrington, conferred at the same time (Stamp 1924; Victoria County History 1959), and thus caused the College no problems. This purchase was all very well, but it left a gap between Crouched Hall and the Buttetourte house. The property that occupied this space was once owned by Simon Goodman, a town burgess (Willis and Clark 1988), and was sold to an archdeacon in Norfolk on his death in 1332 (Stamp 1924). It became the property of Ralph Langelee, Thomas Sutton, and John Clipesby in 1353 (these were probably Fellows of Michaelhouse, given that Langelee was later Master), and was conveyed to Michaelhouse the same year (Otryngham: 50). Originally called the Archdeacon’s House, it was later renamed St Gregory’s Hostel. Neither of these houses were standing by the time the Otryngham Book was compiled (Willis and Clark 1988) – they had been demolished and replaced with a single building. Historical documents vary as to whether it was called St Gregory’s Hostel or Newmarket Hostel, although it was likely that it was rented out as accommodation, rather than being used as part of the core Michaelhouse buildings. No trace of it remained in the 16th century, and Cauis suggests it stood on the site then occupied by the Master’s lodge (Willis and Clark 1998). Besides its core site, Michaelhouse was also endowed a number of houses that it rented out as semi-independent hostels or halls. Still acting as Stanton’s executor, John de Illegh purchased Garrett and Ovyng’s hostels in 1329, at ‘great trouble and expense’, if the Otryngham Book (40ff) is to be believed. These are easy to locate, since they were sited between the enclosed part of St Michael’s Lane to the north and Henney Lane to the south (Otryngham: 44). Henney Lane (named for John Henney, who lived there) is now called Garret Hostel Lane. Both messuages abutted a stream (almost certainly ripa domini Regis) to the west, and a highway (almost certainly Milne Street) to the east. Of the two, Garrett seems to have been the larger and the more important, given that it lent its name to the lane leading to the river, and the area of land between the ripa domini Regis and the river was generally called Garrett Hostel Green. It is possible that the name derived from a ‘gartye’, or a watchtower, suggesting that the building had a high window. It was finally demolished in the 17th century, to be replaced by Bishop’s Hostel (Stamp 1924; Willis and Clark 1988). Narrow Garret Hostel Lane is named after a foundation that was once associated with Michaelhouse. A further messuage was purchased in 1330, comprising a house and land near Great St Mary’s Church (Otryngham: 39–40). This was followed in 1337 by another parcel near Dera de Madingle’s house (Otryngham: 48). In 1349, Michaelhouse was presented with three shops on St Michael’s Lane, complete with a large garden (Stamp 1924). The benefactor was the widow Joan de Refham, whose husband was an apothecary and a town burgess (Stamp 1924). It is possible Refham died during the Black Death (1349–50 in Cambridge), and that his widow hoped either to avoid a similar fate herself by donating property to a quasi-religious institution, or an arrangement was made with the Michaelhouse scholars to say masses for her husband’s soul. This messuage became St Catherine’s Hostel (Stamp 1924). Other hostels mentioned in the Otryngham Book include St Margaret’s, acquired in 1396 (Otryngham: 58). In 1448, Henry VI conveyed to Michaelhouse a parcel of land located to the south of Garrett Hostel Lane, known as Hennaby (Willis and Clark 1998), after its 14th-century owner. This completes the list of Michaelhouse acquisitions in Cambridge, although it owned a number of properties and advowsons in other parts of the country. 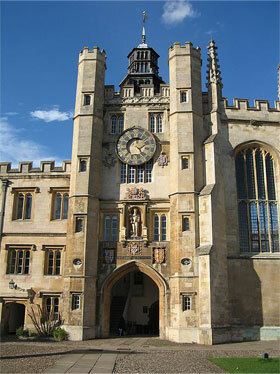 The Clock Tower at Trinity College, originally part of King’s Hall. Unlike King’s Hall and other medieval Cambridge colleges, building records pertaining to the development of Michaelhouse are scanty. It is likely that the Buttetourte house served as the main part of the College – the Buttetourtes were noblemen (Stamp 1924; Willis and Clark 1988), and so the house was probably fairly substantial and relatively comfortable as far as medieval buildings went. The first records that suggest the scholars invested some of their accumulating wealth on repairs and development comes from a document in the Otryngham Book (21) dating to 1380, when £130 was produced to raise twelve chambers and a kitchen (Willis and Clark 1988). Four of these chambers were located somewhere along St Michael’s Lane (Willis and Clark 1998), and another eight sets of rooms were added in the north (Stamp 1924). These buildings are sometimes referred to as the Gootham Work (Willis and Clark 1988), after the benefactor who paid for them. So, by the end of the 14th century, Michaelhouse proper had its hall and conclave (the Buttetourte house) on the west, a range of chambers along St Michael’s Lane in the south, and a second range on chambers opposite to the north, forming three sides of a square. Given that the statutes give a complex set of rules regarding which Fellows were to sleep where (Otryngham: 74, 78), there was apparently a rigidly enforced pecking order relating to rooms. The Gootham Work provided an additional twelve chambers for the scholars. Since Michaelhouse remained small right up to its surrender, and did not expand its numbers significantly after its foundation, it can only be supposed that the Fellows were providing themselves with a higher standard of living – not for them the cramped, unhygienic conditions of most communal living in the Middle Ages! The benefactors list shows that money was also given in 1441 and 1497 for building work, although it does not specify what (Otryngham: 24). There are a number of historic plans that help place some of Michaelhouse’s buildings. The earliest is a plan by Richard Lyne dating from 1574. Michaelhouse is identified as a tower on Findsilver (St Michael’s) Lane and a range of chambers to the west. It adjoins Physwick Hostel, while Garrett and Ovyng’s stand to the southwest and Gregory’s is located to the north. However, by this time, Michaelhouse was part of Trinity, and work had been underway for 34 years to convert the muddle of small buildings into a functional whole. This included closing Foule Lane (Stamp 1924; Willis and Clark 1988), which separated Michaelhouse from Physwick Hostel. From Lyne’s plan, Willis and Clark (1988) conclude that Michaelhouse comprised a tower gateway facing south that led to a court. On the north was the Gootham range built in the 1380s; on the west were the hall, Master’s room, conclave and library; and on the south was a range that backed onto St Michael’s Lane, probably also raised in 1380 and paid for by the Gootham bequest. There is nothing to suggest that there was ever an east side (Willis and Clark 1988), although it was probably enclosed by a wall.8 To the west of the court were the grounds that extended down to the ripa domini Regis. Willis and Clark (1988) also project that there was a kitchen court to the north, tucked between the north wing and St Gregory’s, and probably including stables and other outbuildings. A plan by John Hammond in 1592 shows that Garrett and Ovyng’s hostels were still extant at that time, and are recorded as two small houses, one slightly to the west of the other. Garrett Hostel Green was divided from Michaelhouse by the ripa domini Regis, which was navigable in the 14th century. Evidence for this comes from the fact that there were at least three hythes on it – Dame Nichol’s (belonging to King’s Hall), Flaxhythe, and one on the Buttetourte land. By 1423, permission was granted to Michaelhouse to dig a new one (Willis and Clark 1988), indicating that it had silted up. Some years later, Michaelhouse purchased Garrett Hostel Green itself (the Wren Library stands on it). The next available plan is that of David Loggan (1688) (see Map 2), but by then Great Court and Neville’s Court were complete, virtually all traces of Michaelhouse had been eliminated – and even the great gateway of King’s Hall had been moved. 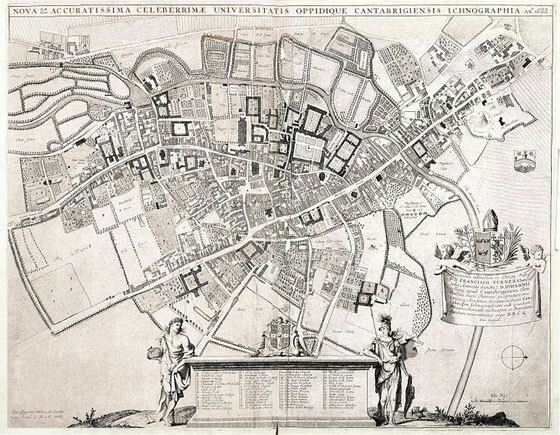 Map 2 – David Loggan’s 1688 plan of Cambridge. Given that Michaelhouse stood in the southwest corner of what is now the Great Court of Trinity College, there has been little opportunity for archaeologists to dig it up. A survey of available literature brought to light only one archaeological report, now more than a hundred years old (Atkinson, 1891–94). More recent surveys (Trevelyan 1983; Willis and Clark 1988) have relied solely on architectural evidence and on maps (such as Lyne  and Hammond ), drawn years after Michaelhouse surrendered to Henry VIII. However, by assessing the evidence uncovered by Atkinson, and relating it to the plan of Michaelhouse proposed by Willis and Clark (1988), a better idea of Michaelhouse can be obtained. While some alterations to the buildings south of Trinity’s hall were being conducted, some foundations came to light. Given their location, Atkinson assumed they belonged to the hall of Michaelhouse. He points out that the hall of a small institution like Michaelhouse, which seldom had more than two dozen members even at the height of its power, would hardly have been able to accommodate the additional hundred or so scholars from King’s Hall and the other seven hostels. Michaelhouse’s hall, if it were to be of use, would have been extended (see later). As if to underline the dangers of accepting too literally the details of plans made in the 16th and 17th centuries – where accuracy may have taken second place to artistic merit – Atkinson’s findings do not sit well with the documentary evidence. Hammond’s (1592) plan shows a three-storeyed building with no buttresses, and an oriel with a range of four other windows to the north and three to the south. A library plan of 1595, however, has a different number of windows both to the north and south of the oriel, plus fewer chimneys. By the time Loggan’s plan (1688) had been drawn up, the old hall had been converted to butteries and a new kitchen had been built. The oriel survived until the 1770s, when the whole range between the present hall and the southwest corner of the court was demolished (Willis and Clark 1988). Because new cellars were included in the rebuilding, most of the original foundations were also destroyed. All that was left of Michaelhouse were the rubble foundations of the oriel and four buttresses; two of the buttresses retained the lowest course of dressed masonry (Atkinson 1891–94). None of these can be seen, because the plinth of the replacement building buries them by a depth of at least 0.5m. Atkinson’s excavations suggest that to the north of the oriel, the buttresses were almost twice as far apart as those suggested on the 1592 plan, while the buttresses to the south were about 4.5m apart, as opposed to the plan’s estimated 3.5m. Using Atkinson’s diagrams, it is possible to determine a new set of dimensions for Michaelhouse’s hall. It seems it was about 23m in length, and was about 12m in width. Atkinson maintains that since this would have represented a sizeable room for a mere two dozen scholars, it must be assumed that the hall was lengthened during the 1550s when a larger hall was required. Willis and Clark (1988) do record an extension being made to the northern end, so it seems Atkinson was correct. However, it should not be forgotten that the small community of Michaelhouse scholars tended to live well – as exemplified by the addition of an extra twelve chambers for the already existing Fellowship – and just because other, less well endowed institutions tended to live in cramped conditions, there is no reason to assume that Michaelhouse did, too. Besides measuring the foundations, Atkinson also discovered some fragments of the oriel window mouldings. From these, it is possible to project that the transoms were arched and that they formed a delicate three-light window. In an attempt to date them, I visited the surviving arches belonging to King’s Hall, to see if there was any similarity. There was none, and it seems the King’s Hall range pre-dates the Michaelhouse fragments by at least a hundred years. From the size and shape of the Michaelhouse fragments, I would be inclined to suggest that they dated from the 1550s building period, and not from the Buttetourte house. Using the archaeological evidence and the plans in conjunction, Atkinson was able to reconstruct a plan of the hall after its 1550s remodelling. It shows an open-plan room with a central hearth (evidence for this comes from the chimneys in Hammond (1592) and the plan of 1595. At the southern end, near the light flooding in from the oriel window, would have been the high table. Atkinson divides the southern room into two, although I would contend there is no evidence on which to base such a conclusion. It is more likely to have been a single room, known as the conclave or the combination room (Leader 1988). These were always at the high table end of the hall, and were places where the Fellows could gather to talk in the evenings – the origins of the Fellows’ common rooms still used today (Grant 1996). To go with Michaelhouse’s generously proportioned hall, it is not unreasonable to assume it also had a comfortably large conclave. To the north of the hall were a series of screens forming a passage that would have allowed servants to serve meals cooked in the kitchens. The northern end of the hall was extended in the 1550s (see below), and so it is difficult to guess what might have been the original Buttetourte hall and what was added later. However, it is likely that the passageway to the kitchens and the two adjoining rooms (buttery and pantry) are later additions, because it is more likely that the original kitchen would have been in the north courtyard described by Willis and Clark (1988) – well away from the main buildings to reduce the risk of fire. The passageway, buttery, and pantry, therefore, were added in the 1550s, when there would have been a reason to link the hall with the newly raised kitchens. When Trinity was handed to its new scholars in 1540, they found themselves in possession of a chapel (King’s Hall), three halls (Michaelhouse, King’s Hall, and Physwick), seven hostels, and a number of accommodation ranges. College account books are missing for the first three years after its foundation, but Willis and Clark (1988) believe the property to have been occupied without substantial change until the 1550s. At this point, records show that part of Michaelhouse was demolished (probably the north range) to make room for a larger courtyard, and its raw materials sold off.9 The Accounts also mention that in the same year, Michaelhouse’s main gate was blocked, Foule Lane was enclosed, and a new gate (Queen’s Gate) was built that opened into St Michael’s Lane (wrongly called Michaelhouse Lane in Willis and Clark). Parts of Michaelhouse survived however, including the south range that overlooked St Michael’s Lane and the chamber in the gate, and the hall and associated kitchens in the west wing (evidence for this comes from Hammond’s plan of 1592, in which these parts of Michaelhouse are still extant). The Accounts later suggest that the hall was extended northward to meet a range belonging to King’s Hall. This arrangement did not survive for long. In the late 1590s, work began on upgrading the southern range, although the extent of this is not known. Loggan’s drawing of 1688 shows a hall with an oriel window, although whether this bears any resemblance to the original Buttetourte property is not known. It is unlikely that Buttetourte’s house had three storeys – as the hall in Loggan’s drawing boasts. When the Queen’s Gate was repaired in the 1750s, the surviving south range was so extensively repaired that Willis and Clark (1988) consider the work a rebuild. And the last part of Michaelhouse – the old hall – was demolished and rebuilt in an Italianate style under the direction of the architect James Essex. How much of the plan of Michaelhouse’s hall determined by Atkinson (1891–94) can be dated back to the original Buttetourte property? And how far does present-day Trinity and its bordering streets and properties reflect the projected outline of the College before its surrender? Apart from the new ranges raised in the 1380s, Michaelhouse’s documents suggest that the College tended to concentrate on acquiring new properties and sites than on developing what it already possessed. It was a small Society, and its scholars came from humble beginnings (Stamp 1924). To begin with, at least, their expectations would not have been great – unlike the pampered clerks and scribes who were sent for training in the comparatively luxurious surroundings of King’s Hall. By the end of the 14th century, however, Michaelhouse was wealthy by University standards. It owned all the land in a great square between King’s Childer Lane in the north and Garrett Hostel Lane/St Michael’s Lane in the south, and between ripa domini Regis in the west and Foule Lane/Milne Street in the east. It also owned a chunk of land and three shops farther north, plus two houses and their land on the High Street. And there were also properties outside Cambridge, including the advowsons of Tittleshall in Norfolk, Cheadle in Staffordshire, Grundisburgh in Suffolk, and Barrington in Cambridgeshire (Stamp 1924; Victoria County History 1959). There is no reason to suppose that the scholars did not put some of their considerable funds to providing themselves with some comfortable lodgings. The statutes lay out strict guidelines for the sharing of rooms in order of seniority, suggesting that at least some of the Fellows had rooms to themselves – an almost unprecedented luxury in medieval times. It is likely that they were shared with students, but Michaelhouse was slightly different in that its records suggest that – unlike King’s Hall – teaching took second place to personal study. And the spacious conclave also suggests that Michaelhouse had abandoned its shabby beginnings and was moving on to better things. Willis and Clark (1988) refer to the original Buttetourte house as a ‘mansion’, and mention that the Buttetourtes themselves were minor nobility. And Hervey de Stanton was a rich man – the fact that he deposited £800 in one place is a testament to quite considerable wealth, and that he had no children implies that he had plenty to spend on the institution that would secure his name for posterity. I would speculate that Atkinson’s plan largely reflects the original Michaelhouse hall (the Buttetourte house), minus the small section at the northern end that was added in the 1550s. There was probably an oriel window in the original hall, although the fragments recovered by Atkinson in the 1890s suggest that it may have been altered or updated in the 1550s. The second question to answer is the one regarding how Michaelhouse’s relentless acquisition of properties between the High Street and the river allowed the development of Trinity College in the form in which it stands today. The western range of the Great Court follows exactly the projected outline of the old hall of Michaelhouse (now the Essex range), while the southern range follows the line of the buildings raised in the 1380s. The north range probably ran where the central north–south footpath is, while the wall that separated Michaelhouse from Foule Lane would have run along the route of the main east–west footpath. Trinity Great Court is divided into quarters, and the southwest quarter is exactly where Michaelhouse’s main court would have stood. Michaelhouse’s scholars would have used Trinity Lane when they walked between College and their church. Meanwhile, New Court and Neville’s Court stand completely on land acquired by Michaelhouse. In fact, although King’s Hall was the larger and better known of the two Colleges surrendered to Henry VIII, it was Michaelhouse that provided it with most of its land. Meanwhile, the boundary between Michaelhouse land and the property of neighbouring Gonville Hall (later Gonville and Caius) was St Michael’s Lane. This did not suffer the same fate as many of the lanes that ran between the river and the High Street – which were enclosed when the Colleges demanded it so (like King’s Childer Lane). It is still possible to walk down St Michael’s Lane (now called Trinity Lane) to Milne Street (now called Trinity Hall Lane and a quiet backwater), although it was not Michaelhouse that applied for access from the lane to the river to be blocked (this occurred in 1306, before Michaelhouse took possession of the land). To reach the river, Garrett Hostel Lane is taken – another of Michaelhouse’s properties. Michaelhouse might be long gone, and its only surviving stones buried beneath the Essex building of the 18th century, but its legacy survives. 1. The townspeople had long been bitter at the preferential treatment of scholars, who came under the more lenient canon, rather than secular, law. The riots accompanying the Peasant’s Revolt provided an excellent opportunity for old scores to be settled, and a number of University properties were attacked, not least Great St Mary’s, in the tower of which was the University Chest. The Chest and its contents were burned in the Market Square, dominated by a lady named Margery Starre, who stood by the inferno yelling ‘Away with the learning of the clerks. Away with it!’ (Victoria County History 1959; Leader 1988). 2. John Otryngham (d. 1455) was an enthusiastic Master of Michaelhouse who copied old title deeds, benefactions, statues, and other documents into a precedents book, which later became known as the Otryngham Book. Where the Otryngham Book has been used here, the number following represents the page (i.e. Otryngham: 22). 3. A conveyance of 1294 describes the plot as being bordered by ripam domini Regis (Willis and Clark 1988). This cannot be the ‘King’s Ditch’ of later times, since maps show it as swinging eastward in a great arch from the Great Bridge (near Magdalen) and meeting the river again near Small Bridges (present-day Silver Street). It appears that a number of streams and ditches – and there seem to have been a great many of them in the 14th century – were called King’s Ditch or Common Ditch, and it may simply reflect who ‘owned’ them in terms of collecting tolls or keeping them clear. In terms of Michaelhouse, early maps and archaeological evidence suggest that there was a semi-circular extension of the River Cam that allowed access to the merchants’ stores on Milne Street, which may have been the ditch in question. Of course ‘ripa’ can also mean hythe, or dock, as well as a river bank. 4. See Hist. Cantab. Acad. i. 48. Willis and Clark’s (1988) translation is used here. 5. The lane to Dame Nichol’s Hythe is generally accepted to be King’s Childer Lane, which ran down to the junction with the River Cam and what is probably the ripa domini Regis. 6. Perhaps this is a reference to the Crutched Friars, who were given permission to settle in England after 1244, although they were never numerous (Lawrence 1994). There was a community of Crutched Friars at Barham (Victoria Country History 1959). Willis and Clark (1988) maintain the origin of the word comes from ‘cross bearing’. 7. Senior Bursar’s Accounts, 1546–47. 8. The town-and-gown strife is as ancient as the University itself, and no College or hostel valuing its safety failed to protect itself in some way. Although the early gatehouses may have been a little excessive to repel angry shopkeepers and apprentices, they illustrate that the more powerful and wealthy the institution, the more serious were its defences. It seems very unlikely that Michaelhouse would have left its eastern angle unguarded, and it almost certainly would have been protected by a wall. 9. Senior Bursar’s Accounts, 1550–1. Atkinson, T.D. 1891–94. On the hall of Michaelhouse. Proceedings of the Cambridge Archaeological Society. Volume VIII, Series II: 234–242. Atkinson, T.H. and J.W. Clark. 1897. Cambridge Described and Illustrated: Being a Short History of the Town and University. London. Cobban, A. B. 1969. The King’s Hall: Within the University of Cambridge in the Later Middle Ages. Cambridge Studies in Medieval Life and Thought, 3rd series, Vol. 1. Cambridge: Cambridge University Press. Dyer, G. 1814. History of the University and Colleges of Cambridge; Including Notices of the Founders and Eminent Men. Vol. 2. London: Longman, Hurst, Orme and Brown. Grant, E. 1996. The Foundations of Modern Science in the Middle Ages: Their Religious, Institutional, and Intellectual Contexts. Cambridge: Cambridge University Press. Lawrence, C.H. 1994. The Friars: the Impact of the Early Mendicant Movement on Western Society. London and New York: Longman. Leader, D.R. 1988. A History of the University of Cambridge. Volume 1: The University to 1546. Cambridge: Cambridge University Press. Stamp, A.E. 1924. Michaelhouse: Notes on the History of Michaelhouse Published on the 600th Anniversary of the Foundation of the Society by Hervey de Stanton. Printed privately. Trevelyan, G.M. 1983. Trinity College: an Historical Sketch. Cambridge: Trinity College. Victoria County History. 1959. Victoria County History of the County of Cambridge and the Isle of Ely. Volume III. London: Dawson Press for the University of London Institute of Historical Research. Willis, R., and J.W. Clark. 1988. 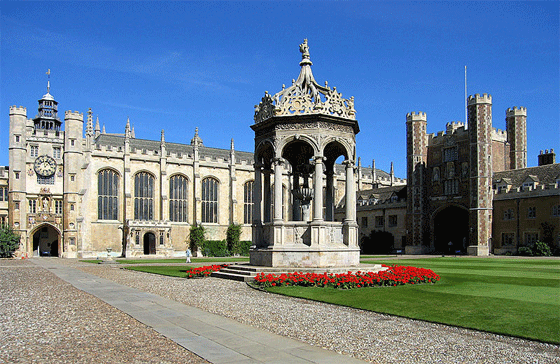 The Architectural History of the University of Cambridge and of the Colleges of Cambridge and Eton. Cambridge: Cambridge University Press. © 2019 Susanna Gregory. All rights reserved.